Intel's Atom chips are on their way out of mobile devices, and the next generation of the chip line will instead be targeted toward drones, self-driving cars, and IoT devices. The new Atom chips will retain the line's focus on low power consumption, with an emphasis on graphics and visual computing. The chip line, to be announced next week at Intel Developer Forum, will be used to maneuver cars, drones, and robots and to also help them recognize objects. Many Atom mobile and server chips have been on Intel's chopping block. The troubled chip's future now is in the growing markets of IoT and virtual reality. The chips will integrate into devices with the company's 3D RealSense cameras, according to a technical session description at IDF. That points to the chips also being used in low-power virtual reality headsets. Intel will lay out its VR and augmented reality strategy at the developer show, and RealSense is expected to be at the center of many announcements. Intel will show off its own version of Microsoft's HoloLens called Remote EyeSight, a set of head-worn AR smart glasses for remote collaboration. Expect the bread-and-butter products for the new Atom chips to be smart home and industrial IoT devices. The chips, according to the technical session page, will also work in devices with "advanced displays," which could refer to information kiosks or digital advertising displays. Intel declined to comment on the next-generation Atom chips, the details, or the underlying architecture. The chips could be based on the Broxton architecture, conceived by Intel originally as a way to quickly design and release new Atom chips to catch up with market leader ARM in smartphones and tablets. 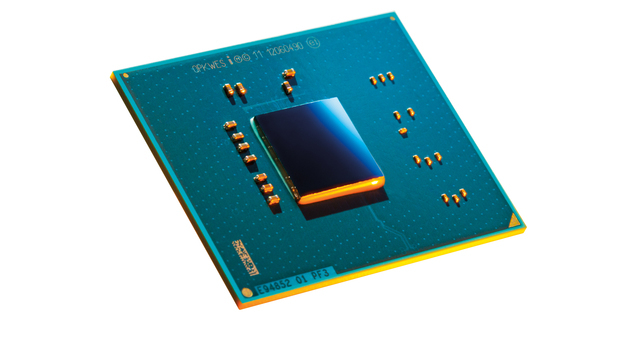 The new chips ensure the survival of the Atom product line, which had an uncertain future. Atom chips for mobile devices were the first on the chopping block after Intel announced plans earlier this year to lay off 12,000 employees and restructure operations to focus on servers, connectivity, IoT, and other areas. However, Intel is still using Atom chips like Sofia -- which it was supposed to cut -- for point-of-sale systems and industrial IoT devices. The Atom architecture called Goldmont will be used in upcoming Celeron and Pentium PC chips code-named Apollo Lake. Those chips were originally based on the same architecture used in high-end Core PC processors. The new Atom chips could go into AC power-connected devices for digital signs, cash registers, and casino gaming machines, said Jim McGregor, principal analyst at Tirias Research. "It won't be for small, battery devices," McGregor said. Intel's done a good job of scaling down the size and power consumption for x86 architecture with Atom, but the chip isn't as power efficient as ARM or MIPS for low-power devices, McGregor said. Atom, in a way, is coming back to embedded devices -- which it was originally designed for -- but an ill-advised mobile route has given the chip a bad name, McGregor said. "They have to rebrand it. There's so much failure around it," McGregor said. The Atom chips were at the forefront of the netbook explosion from 2007 to 2010, then were tweaked for tablets and smartphones. Atom smartphones never really took off, and in a desperate move, Intel in 2014 said it would ship 40 million tablet chips, then hit 46 million chips. But by the time Intel found its groove in tablets, that market started declining.